Food. Ah, food. I've had a weird relationship with you lately. Some days nothing sounds good, but I know we all need to eat. I'm tired of eggs. We've had way too much food with eggs. Breakfast burritos, egg salad sandwiches, fried egg sandwiches, omelets, quiches, frittata. BLEH. 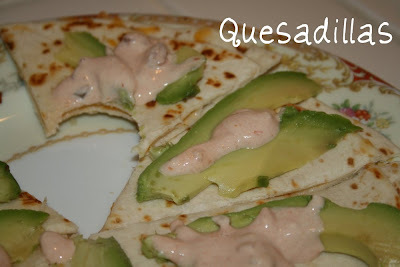 Today I'm sharing my recipe for quesadillas. I got creative with the sauce and placed layered, thin slices of avocado on top. Eric had fun dabbing the sauce on top of his wedges. It was cute when he'd take a bite and go "Spicy!" and then dig in. Eric actually likes spicy food! 1. Heat a skillet over high heat. Add about 1 tsp of oil to the pan. When hot, place one tortilla in the pan. Immediately top with shredded cheese and other optional ingredients. Place second tortilla on top. 2. In a small bowl combine about 1 tablespoon salsa with 1 tablespoon sour cream. Mix well. 3. Cook quesadilla until bottom tortilla is desired level of crispy, golden brownness. Flip and cook other side. 4. Transfer to cutting board and cut into wedges with a pizza wheel. 5. Top wedges with thin slices of avocado and salsa-sour cream mixture. Note: For a kid size quesadilla, put filling on one half of the tortilla in the pan and fold over in half. Cook, until desired done-ness and flip to cook the top.